The Amazon rain forest isn't necessarily a place that many would associate with a drought, yet prolonged dry spells are projected to become more prevalent and severe because of climate change. The question at hand is how these droughts are going to affect the rain forest, as it has a large influence on global climate and future warming. 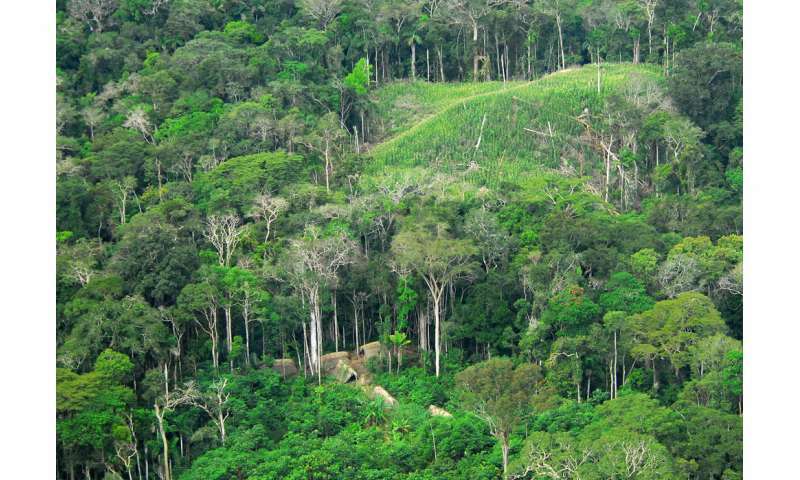 A study led by Marielle Smith, a research associate in Michigan State University's forestry department, and Scott Stark, assistant professor of forestry, examines the Amazon's response to droughts in order to better predict how forest growth and physiology will affect tree diversity and, ultimately, the planet's climate. "This is useful because the activity of a forest as a whole—its growth and exchanges of gas and energy with the atmosphere—is largely determined by how leaves are distributed in the mosaic of environments that the forest itself creates," Smith said. "Through the lidar lens, we surveyed the structure of an eastern Amazon forest over several years to see how it changed in response to seasonal water stress and a strong El Niño drought," Smith said. "Our higher-resolution data allowed us to divide the forest by both height and light environments, and revealed something more complex," Smith said. The expectation was that when the amount of leaves in tall trees increases during the dry season it gets shadier underneath, and smaller trees lose some of their leaves as a result. However, the data showed that's not what happened. Instead, it was the small trees that were in open areas where shading was low and sunlight high—forest "gaps—that lost leaves. Trees that were shaded, surprisingly, added leaf area at the same time as the tall trees. The trends were the same in response to drought. "It is key to understand that dry periods are typically sunnier periods," Smith said. "Tall trees that also have deeper roots, giving more access to water, may take advantage of the increased light and expand their crowns. Small trees with shallow roots may be hurt more by hot, sunny conditions and contract their crowns or die. Small trees in the shade, however, may take advantage of increased light in the cooler, more humid understory." These results show that a tree's response to dry periods is dependent on environmental conditions imposed by the structure of the rainforest itself, the researchers said. The findings agree closely with emerging studies showing that short statured vegetation, particularly in hot, high light environments, is most impacted by water shortages.